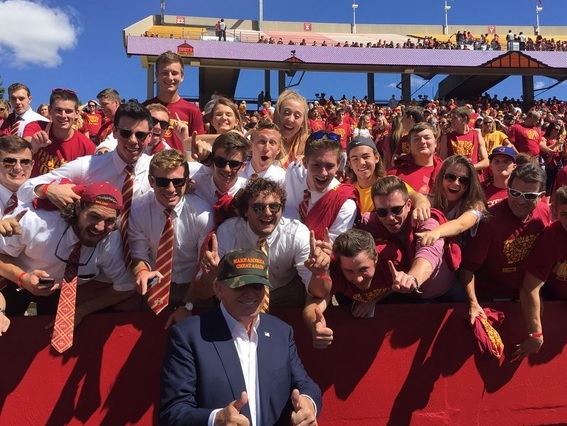 VIDEO=> Donald Trump Stumps in Boone, IA - Says His Hat Is "Hottest Thing in Fashion"
Donald Trump spoke to a record crowd in Boone, Iowa this afternoon. Hundreds turned out to the event after the annual Pufferbilly Days parade. Trump bid Rick Perry adieu and lashed out at Dr. Ben Carson. Donald Trump joked that the engineer of an approaching train slowed down to hear his speech. Republican candidate Donald Trump says American voters want a president with an “aggressive tone” and that’s why he’s leading in the polls. The crowd of about 600 cheered. Trump spoke early this afternoon, right next to the busy railroad tracks that run east to west through Boone. As the crowd laughed and clapped, Trump joked the engineer had slowed the train because he wanted to listen to the speech. They cheered his promise to cut taxes for the middle class and raise taxes on wealthy “hedge fund managers”. There was only a smattering of applause, though, when Trump mentioned Rick Perry, the former Texas governor who dropped out of the race Thursday. Trump left the rally to attend a tailgate party this afternoon.